I was having a bad week when I started reading the third Harry Potter book on the train ride home. My spirits instantly lifted. As I have said before in my previous reviews, Book 1, Book 2, there’s a bit of nostalgia that comes along with reading these books. But beyond that, for this book in particular, it took me away from my troubles and allowed me to escape what had been bothering me. It was such a relief. So much happiness! Every time I picked it up, I knew that I wouldn’t want to put it down. I’m going to declare now that this is my favorite book in the series. 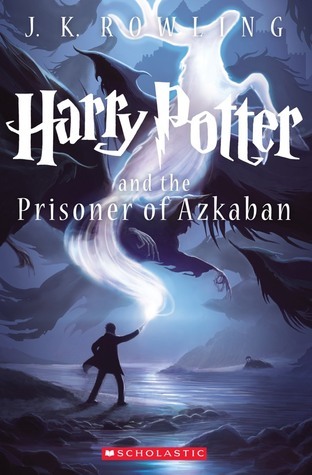 The book sets up a lot of information that we know we’re going to need later on, but without all the heavy things that come with it–Voldemort returning, the Order of the Phoenix, Dumbledore’s Army, the book acts as a stepping stone for the more serious subject matter that we get into later. And we already start seeing serious subject matter, the execution of Buckbeak, the dementors sucking your soul, betrayal from a family friend. It’s heavy stuff for it’s intended audience of 13-year-olds. After all this gushing of emotion and happiness, I did find myself with a few parts I could have done without. Any story line with Draco seemed pointless and the Quidditch matches were very long. I could never get into them, but I understand they are important for world building (Quidditch), and character development (Draco). They just seemed long. I was always anxious to get to the next chapter, BUT I was just as thrilled when Harry caught the Snitch and won the Finals. I can’t really criticize too harshly. The book has been a good companion this week. Awesome. I also recently re-read the series and for me as well, it uplifted my spirits and helped improve my mood on a day-to-day basis. Crazy, right? I was not expecting it, but I’m glad the books haven’t lost their enchantment! I actually feel like that’s one of the things that makes this such an impressive series, is that you can come back to it years later and it still has the same effect as if you were reading it for the first time.